attend conferences and training initiatives, bringing the latest advancements in the diagnosis and treatment of illnesses and injuries to our pediatric population. At the Janeway, we pride ourselves on providing high quality healthcare and we are proud to invest in the education and learning of our physicians and staff. Your donations go toward providing opportunities for our practitioners to gain new knowledge, which allows them to provide the best care possible. A quick glimpse of some of the Specialized Equipment purchased this past year. Our eyes not only affect how we see, but also how we feel, impacting all aspects of our lives. Ensuring that Janeway staff have the latest advancements in diagnosing and treating eye disease, or problems, is of paramount importance in the care of our children. 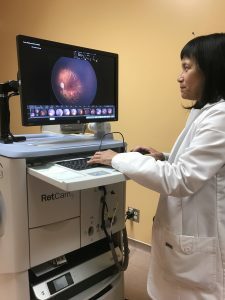 In partnership with you, our donors, the Janeway Foundation has funded a Mobile RetCam Digital Imaging System, a noninvasive, advanced system that captures brilliant, full colour digital images of the retina of the eye. These images can be used for immediate evaluation of eye conditions and shared electronically with off-site medical practitioners for remote consultations, facilitating a convenient method for second opinions. They can also be stored in the patient’s medical history for ongoing assessment of conditions and treatment. These advancements in digital imaging of the retinas have assisted physicians in the evaluation of childhood eye diseases and can help to preserve the vision for our smallest patients. In NICU for Premature Babies – When children are born premature they are tested for a condition that can compromise their retinas, called Retinopathy of Prematurity (ROP). In severe cases, this condition may also cause blindness. In Full Term Newborns – To obtain images for physician evaluations of eye disease and to establish a baseline for future eye health. In the OR – Imaging full-term newborns may require anaesthesia. With easy mobility the RetCam can be moved to the required location within the hospital. In Pediatric Clinics – The images obtained through the RetCam are an effective educational tool for both parents and staff, helping to better understand the eye condition and the physicians’ evaluation of eye disease and required treatment protocol. The Janeway is the primary clinical resource for pediatric teaching and research. Through a broad range of health professions in medicine, nursing and related health services, the Hospital and Memorial University work together – training the health care providers of tomorrow. Our Hospital also houses the only pediatric research centre in the province that has overseen up to 50 research projects at any given time. Each year, the Janeway Foundation, on behalf of our donors and partners, funds $150,000 towards vital pediatric medical research. This year’s donation will fund research in areas including: high risk births, childhood obesity, genetics, infant feeding, and mental health. The medical research work conducted at the Pediatric Research Unit has the potential to have long-term and positive impact on children and their families. Many children spend extended periods of time at the Janeway dealing with serious health concerns that affect their overall well-being and mental health. Through donor support, our medical team is able to provide programming in areas such as LifeStyles, Eating Disorders and Diabetes, all of which teach children to better care for themselves today, improving their overall health for the future. Telemental Health is one of the most active telemedicine services utilized in Canada and other countries, including the United States and Australia. Telemental Health is an internationally based broad term referring to the provision of mental health and substance use services from a distance. By using advanced communication technologies, mental health professionals are able to widen their reach to patients in a cost effective manner. When children and their families are dealing with serious issues that affect their well-being and mental health, they can spend extended periods of time at the Janeway. Being away from their extended family members and friends can place added stress, during what can be one of the most challenging times in their lives. extensive travel and, at times, long hospital stays. The Telemental Health Program, has been enhanced and expanded, improving patient access to health care professionals, addressing pressing needs in underserviced areas, while allowing for early intervention. Without this early intervention, children and youth suffering from mental health problems could face profound implications in the future, as they grow into adulthood. By providing the technological equipment required for videoconferencing our youngest patients can speak with their mental health care professionals monthly, weekly, or even daily, without the added stress placed upon them by having to travel long distances. Over the past year usage within the program has increased by 50%, enhancing access for patients and saving families time and transportation costs. The equipment has also been used routinely to offer therapeutic groups to youth who cannot access these services in their home communities. The growth of the Program throughout the province will continue to expand, with additional health care professionals taking part in the training. Ensuring that our children continue to receive the best health care possible is of the highest importance to our Janeway staff. Through the Telemental Health Program we are providing an essential step in preparing our children for their future so they can develop to their full potential. Another program funded by the Foundation is Music Therapy, the clinical use of music to promote mental and emotional health and improve the quality of life for children with psychological or physical conditions. Children like 3-year-old Minxie, who suffers from several cerebral palsy and chronic lung disease. 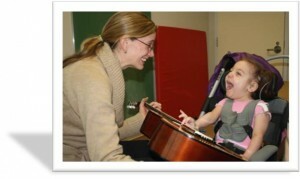 Music Therapy is highly effective in relieving stress and anxiety, warding off depression and helping children learn to move in a fun environment decreasing their overall muscle tension.